Last week, Weinberg Properties filed building permits to construct an eight-story gallery and office building for Pace Gallery at 534-540 West 25th Street. 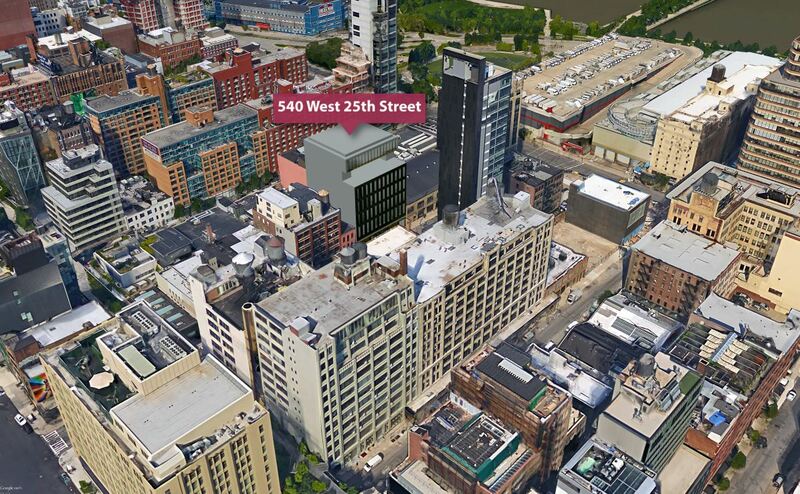 Sited squarely in the Chelsea arts district between the High Line and Eleventh Avenue, the 50,000-square-foot structure will replace an existing one-story building that has served as Pace’s flagship location. The renowned international contemporary art gallery has three other locations in the city, as well as outposts in Menlo Park, London, Beijing, and Hong Kong. Bonetti/Kozerski’s interior design features expansive column-free galleries on the first and second floors and a combination of gallery and multi-use event spaces, private offices and viewing rooms on the third, seventh and eighth floors. The ground-floor space will feature a public library showcasing Pace’s extensive collection of more than 10,000 catalogued volumes and a 5,000 square foot gallery with 20’ ceilings for rotating exhibitions. A spiral staircase will lead visitors to the second floor, which boasts 4,200 square feet of exhibition space, an adjacent 1,000-square-foot terrace, and an open storage system for artworks that were previously accessible only through private viewing, a feature largely inspired by the recent trend of several major public institutions around the country. Pace will also have access to a 6,000-square-foot outdoor gallery on the sixth floor that can accommodate large-scale sculpture and which offers sweeping panoramic views of the Manhattan skyline. The new building is projected to open in fall 2017, and during the interim, Pace will continue to present exhibitions at its other Manhattan locations at 32 East 57th Street, 508 West 25th Street, and 510 West 25th Street.